Think about it. You’re a kid who is being dragged to your aunt’s (or uncle’s) wedding and it’s the last place you want to be because it’s full of grownups are who are just boring! But, what if you had a special gift just for you from the happy couple and what if that gift just happened to be a box of crayons (and something to color on)? 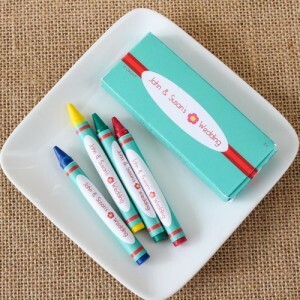 You can find these personalized crayon sets here.